Leah Hogsten | The Salt Lake Tribune Director Jacquelin Olive won the Sundance U.S. Documentary Special Jury Award: Moral Urgency for her film Always in Season, during the awards ceremony for the 2019 Sundance Film Festival at the Basin Fieldhouse in Park City, Feb. 2, 2019. 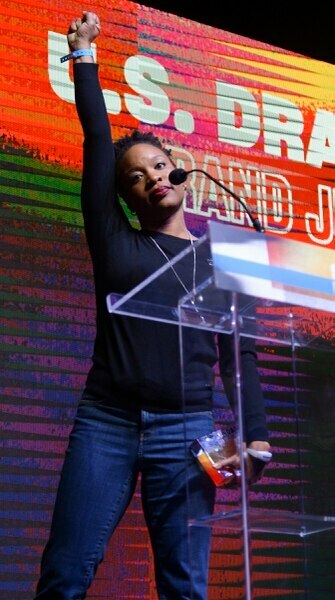 Leah Hogsten | The Salt Lake Tribune Director Chinonye Chukwu accepts the Sundance U.S. Grand Jury Prize for Dramatic for her film Clemency, during the awards ceremony for the 2019 Sundance Film Festival at the Basin Fieldhouse in Park City, Feb. 2, 2019. 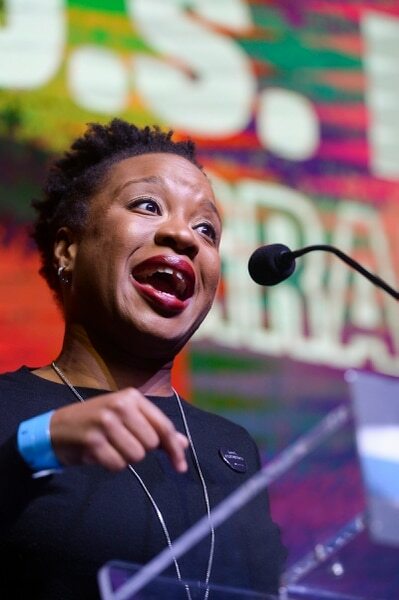 Leah Hogsten | The Salt Lake Tribune Director Chinonye Chukwu accepts the Sundance U.S. Grand Jury Prize for Dramatic for her film Clemency, during the awards ceremony for the 2019 Sundance Film Festival at the Basin Fieldhouse in Park City, Feb. 2, 2019. Leah Hogsten | The Salt Lake Tribune U.S. Dramatic Special Jury Award: Creative Collaboration award was given to director Joe Talbot for the film The Last Black Man in San Francisco during the awards ceremony for the 2019 Sundance Film Festival at the Basin Fieldhouse in Park City, Feb. 2, 2019. Leah Hogsten | The Salt Lake Tribune World Cinema Dramatic Special Jury Award: Originality was awarded to director Makoto Nagahisa for the film We Are Little Zombies, during the awards ceremony for the 2019 Sundance Film Festival at the Basin Fieldhouse in Park City, Feb. 2, 2019. Leah Hogsten | The Salt Lake Tribune Director Chinonye Chukwu accepts the Sundance U.S. Grand Jury Prize for Dramatic for her film Clemency, during the awards ceremony for the 2019 Sundance Film Festival at the Basin Fieldhouse in Park City, Feb. 2, 2019. Leah Hogsten | The Salt Lake Tribune l-r Directors Tamara Kotevska and Ljubomir Stefanov accept the award for World Cinema Grand Jury Prize: Documentary for their film Honeyland during the awards ceremony for the 2019 Sundance Film Festival at the Basin Fieldhouse in Park City, Feb. 2, 2019. Leah Hogsten | The Salt Lake Tribune The awards ceremony for the 2019 Sundance Film Festival at the Basin Fieldhouse in Park City, Feb. 2, 2019. Leah Hogsten | The Salt Lake Tribune l-r Jialing Zhang accepts the Sundance U.S. Grand Jury Prize for her documentary One Child Nation with Nanfu Wang during the awards ceremony for the 2019 Sundance Film Festival at the Basin Fieldhouse in Park City, Feb. 2, 2019. Leah Hogsten | The Salt Lake Tribune Director Chinonye Chukwu accepts the Sundance U.S. Grand Jury Prize for Dramatic for her film Clemency, during the awards ceremony for the 2019 Sundance Film Festival at the Basin Fieldhouse in Park City, Feb. 2, 2019. Leah Hogsten | The Salt Lake Tribune l-r Jialing Zhang accepts the Sundance U.S. Grand Jury Prize for her documentary One Child Nation with Nanfu Wang during the awards ceremony for the 2019 Sundance Film Festival at the Basin Fieldhouse in Park City, Feb. 2, 2019. Leah Hogsten | The Salt Lake Tribune Director/Screenwriter Lucia Garibaldi won the Directing Award: World Cinema Dramatic for the film The Sharks during the awards ceremony for the 2019 Sundance Film Festival at the Basin Fieldhouse in Park City, Feb. 2, 2019. Leah Hogsten | The Salt Lake Tribune Director/Screenwriter Pippa Bianco reacts to winning the Sundance Waldo Salt Screenwriting Award U.S. 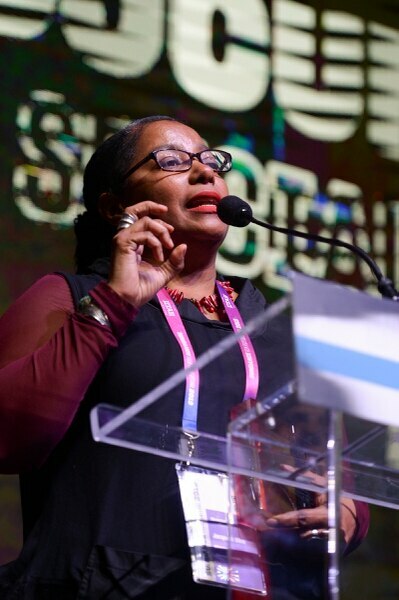 Dramatic for her film Share, Director/Screenwriter during the awards ceremony for the 2019 Sundance Film Festival at the Basin Fieldhouse in Park City, Feb. 2, 2019. Park City • A soul-searing look at the prison workers who carry out capital punishment and an examination of the damage done by China’s one-child policy were the top winners at the 2019 Sundance Film Festival. Writer-director Chinonye Chukwu’s drama “Clemency,” which stars Alfre Woodard as a prison warden overseeing an impending execution, won the Grand Jury Prize for U.S. Dramatic films, in a ceremony Saturday night at the Basin Fieldhouse in Park City. The Grand Jury Prize for U.S. Documentary films went to “One Child Nation,” a China/U.S. co-production about the Chinese government’s longtime policy of allowing couples only one child. U.S./Chinese relations were at the heart of “American Factory,” which won the Directing Award for U.S. Documentary films for husband-and-wife directors Steven Bognar and Julia Reichert. The film follows the opening of a former GM plant in Ohio by a Chinese-owned auto glass company, and the culture clashes between the Chinese bosses and their American employees. Both awards in the Next category, the Audience Award and the Innovators Award (chosen by one-woman jury Laurie Anderson), went to the same movie: Alex Rivera and Cristina Ibarra’s “The Infiltrators,” a semi-documentary drama about undocumented immigrants sneaking inside a border detention facility. All four Grand Jury winners were directed (or, in the case of “Honeyland,” co-directed) by a woman. That is in alignment with talk of diversity that permeated a festival where 42 percent of the directors of the films in the four competition categories were women. That diversity even was reflected in the festival dealmaking, as the first four movies to score major deals were directed by women of Asian descent: Indian-Canadian Nisha Ganatra’s comedy “Late Night” to Amazon, Chinese-American Lulu Wang’s family comedy-drama “The Farewell” to A24, Pakistani-American Minhal Baig’s coming-of-age drama “Hala” to Apple, and “Blinded by the Light,” by director Gurinder Chadha (who is of Kenyan and Indian heritage), to Warner Bros.’ New Line Cinema. The festival ends Sunday with screenings of the award-winning films in Park City, and more screenings in Salt Lake City and the Sundance Mountain Resort in Provo Canyon. • U.S. Dramatic, Grand Jury Prize • “Clemency,: directed by Chinonye Chukwu. • U.S. Dramatic, Audience Award • “Brittany Runs a Marathon,” directed by Paul Downs Colaizzo. • U.S. Dramatic, special jury award for “creative collaboration” • “The Last Black Man in San Francisco,” directed by Joe Talbot. • U.S. Documentary, Grand Jury Prize • “One Child Nation,” directed by Nanfu Wang and Jialing Zhang. • U.S. Documentary, Audience Award • “Knock Down the House,” directed by Rachel Lears. • U.S. Documentary, special jury prize for “moral urgency” • “Always in Season,” directed by Jacqueline Olive. • World Cinema Dramatic, Grand Jury Prize • “The Souvenir” (United Kingdom), directed by Joanna Hogg. • World Cinema Dramatic, Audience Award • “Queen of Hearts” (Denmark), directed by May El-Toukhy. • World Cinema Dramatic, special jury award • “Monos” (Colombia), directed by Alejandro Landes. • World Cinema Dramatic, special jury award for "originality" • "We Are Little Zombies" (Japan), directed by Makoto Nagahisa. • World Cinema Dramatic, special jury prize for acting • Krystyna Janda, “Dolce Fine Giornata” (Poland). • World Cinema Documentary, Grand Jury Prize • “Honeyland" (Macedonia), directed by Tamara Kotevska and Ljubomir Stefanov. • World Cinema Documentary, Audience Award • “Sea of Shadows” (Austria), directed by Richard Ladkani. • World Cinema Documentary, Directing Award: Mads Brügger, “Cold Case Hammarskjold” (Denmark/Norway/Sweden/Belgium). • World Cinema Documentary, special jury prize for cinematography • Fejmi Daut and Samir Ljuna, "Honeyland" (Macedonia). • World Cinema Documentary, special jury prize for “no borders” • “Midnight Traveler” (U.S./Qatar/U.K./Canada), directed by Hassan Fazili. • World Cinema Documentary, special jury prize for “impact for change” • "Honeyland" (Macedonia), directed by Tamara Kotevska and Ljubomir Stefanov. • Next Audience Award • “The Infiltrators,” directed by Alex Rivera and Cristina Ibarra. • Next Innovator Award (selected by a one-person jury, Laurie Anderson) • “The Infiltrators,” directed by Alex Rivera and Cristina Ibarra. • Alfred P. Sloan Feature Film Prize (for movies with science and technology films) • “The Boy Who Harnessed the Wind,” directed by Chiwetel Ejiofor. • Short Film Grand Jury Prize • “Aziza,” directed by Soudade Kaadan. • Short Film Jury Award: U.S. Fiction • “Green,” directed by Suzanne Andrews Correa. • Short Film Jury Award: International Fiction • “Dunya’s Day,” directed by Raed Alsemari. • Short Film Jury Award: Nonfiction • “Ghosts of Sugar Land,” directed by Bassam Tariq. • Short Film Jury Award: Animation • “Reneepoptosis,” directed by Renee Zhan. • Special Jury Award for Directing • “Fast Horse,” directed by Alexandra Lazarowich; and “The Minors,” directed by Robert Machoian.